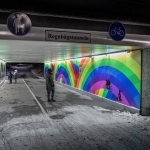 The Leidseveertunnel is a underpass near the central station of the dutch city of Utrecht. The lighting of the tunnel is completely renovated including the wiring. The existing fluorescent fixtures where mounted on a heavy steel structure in both corners of the tunnel tube and consumed a lot of energy. This is removed and replaced by a single line of BB Infralight. The new installation has sleek and comfortable look. This is important because the underpass is also used by pedestrians and bicyclists who prefer a safe environment. 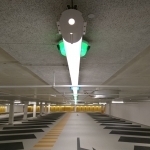 The municipality of the city of Utrecht choose the BB Infralight for its low maintenance cost and long lifetime. The LED lightsource will be completely maintenance free for at least 20 years. A astronomical clock is used to switch the light level between a day and night scene. Doing this saves energy, extends the lifetime of the LED and reduces light pollution to the surroundings. The IK10+ vandal resistance of the BB LEDlightpipe is also an important feature for this underpass. It's of importance that a malevolent passer cannot wreck the lighting easily.